It may only now be autumn but with colder months approaching your vehicle will be more exposed to wet conditions and harsher elements like corrosive road salt, snow and frost. 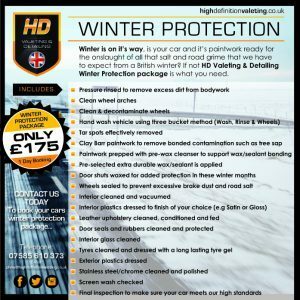 An adequate form of protection is essential during the winter period to help form a barrier against these elements, and keep your car in tip top condition. Our Winter Protection Deal is designed for the British weather and to help provide maximum protection throughout. All bookings are subject to a 40% non-refundable deposit to secure appointment.